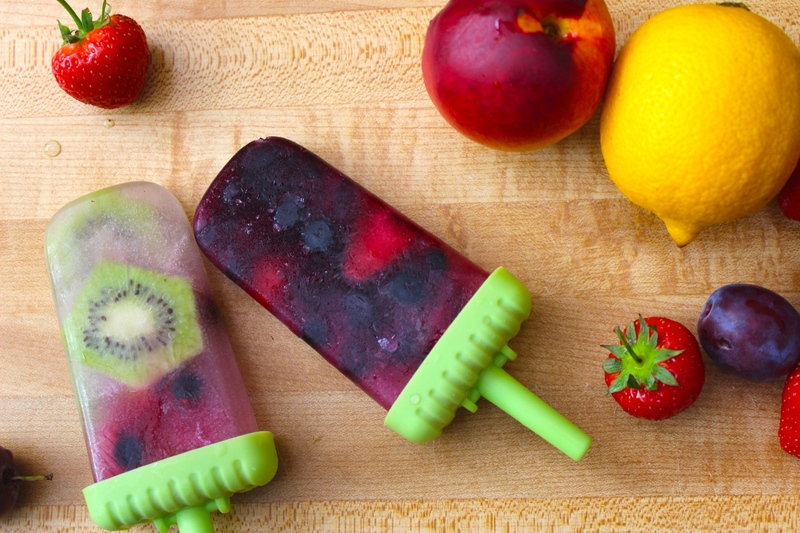 These fruit ice lollies are so delicious & hydrating. They only contain 2 ingredients & take less than 5 minutes to make! Simply chop the fruit & place in the lolly containers. Pour the coconut water over the fruit & fill the containers. The lollies need to freeze for about 5 hours before they are ready for you to enjoy. I chose mixed berries as they are an excellent source of fiber, potassium & vitamin C.
Kiwi fruits are packed with the vital nutrients vitamin E, copper, Vitamin K, Choline, magnesium & phosphorus. They are also higher in Vitamin C per ounce than most other fruits. Coconut water is low in calories & contains lots of potassium & is super hydrating. It’s naturally refreshing & is an easily digested carbohydrate in the form of sugar & electrolytes. Including: calcium, magnesium, phosphorous, potassium & sodium. Additionally coconut water is high in soluble fiber & aids in prevention of indigestion & reduces the occurrence of acid reflux. Al ages can enjoy these healthy lollies & they last for ages in the freezer. I hope you enjoy!